Versatility - The CST/berger can perform a huge range of tasks, including ones that require a high degree of accuracy to those requiring a huge range. Accessories Included - The RL25HCK Model comes with a 8 foot leveling rod, aluminum tripod, and three batteries. The only cons of CST RL25HCK Laser Level is its average warranty length. The CST has a two-year warranty while other rotary laser levels like Dewalt DW079KD or Johnson Level Tool 99006K have a longer warranty length of 3 years. The CST/berger Rotary Laser Level is accurate to 3/32 of an inch at 100 feet, which is very impressive and should be sufficient for any job a professional contractor would come across. Its range increases to 2,000 when used with the RD5 laser detector, meaning it can accomplish most large surveying jobs. This feature automatically levels the laser, thus taking human error out of the equation and significantly increasing accuracy. It will also increase your efficiency. The time it would have taken to calibrate the laser— which in certain situations, especially outdoors, can be quite difficult– you can spend getting the job done. If the CST RL25HCK laser becomes out of level for any reason, it will alert you to the problem. Being able to measure slopes allows you to measure what grade you need to pave a driveway, or for irrigation and drainage projects. The CST/berger rotary laser RL25HCK allows you to change slopes easily, making it easy to switch between several different levels. The CST/berger Rotary Laser includes many beam visibility enhancements (strobe, speed control, etc) with available speeds ranging from 1, 150, 300 and 600 RPM. It also features scan angles of 10, 25 and 50 degrees. The rotary laser commands an impressive battery life, using (3) D cell batteries to reach 85 hours of operating power. It also has a helpful gauge that provides plenty of warning as to when the batteries need to be replaced, meaning you never need to worry about losing power on the job. One of the biggest pros to the CST/berger RL25HCK Rotary Laser is its durability, as shown by its high IP rating of 56. IP ratings predict how resistant your electronic device is likely to be from factors like water, shock and foreign objects. This high rating is partially due to its rugged design with extra protection in key impact areas, including a thick glass case that protects the laser. These protections make it able to withstand a three foot drop without any problems. It also has a compact carrying case that will keep it protected in the back of the truck with all the other tools. With its durable design and IP rating of 56, you can rest assured the laser will perform well in harsh conditions on the job site. 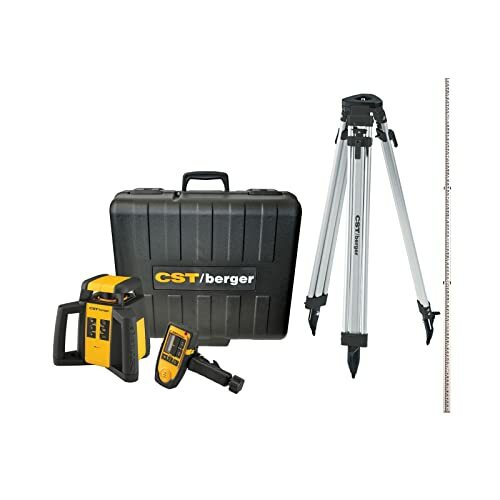 The CST/berger RL25HCK Rotary Laser Level is well suited for a variety of indoor and outdoor projects, such as installing cabinets and windows, making sure walls are aligned correctly, drop ceiling installations, masonry alignment and shooting grade, determining land elevations, among many others. With the high accuracy at 3/32 inch per 100 feet, the CST/berger laser is great for jobs that demand a high level of accuracy. Other such jobs include laying a foundation or grading a driveway to ensure proper drainage. The CST/berger RL25HCK Self Leveling Rotary Laser Level is one of the highest performing rotary levels on the market, great for professionals who want a reliable laser level able to complete a wide range of tasks, from the common to the very technical. Although it delivers professional quality performance, it is still simple enough for amateurs to operate. No matter who is buying it, the CST/berger Rotary Laser Level is a great investment and likely to perform well for many years. Hassle-free measurements with top advanced laser tape measure. Discover here!